Imagine this: Debbie arrives at church after a challenging week of working too many long hours and racing to complete to meet a deadline. She felt exhausted, raw, and unable to listen to the sermon or sharing time. She needed to share her story with someone in hope to find healing and new life. After church, Mary approached Debbie and asked her how she was doing. The words began tumbling out of Debbie as she shared the awfulness of the week. Unfortunately, Mary wasn’t really interested in hearing Debbie’s story; Mary wanted to tell Debbie about her week. Soon Debbie noticed that, while Mary was sort of listening to her, she was instead looking around as if she wanted to find someone else to talk to. Debbie stammered on into the story of receiving a speeding ticket and Mary interrupted her: “That’s nothing. My car got towed this week when I parked it in a tow‑away zone. I had to get my sister to take me to the police impound and pay $150.00 to get it out. I cannot afford to lose that money just now, etc., etc. ….” Debbie mutely nodded while Mary continued with her story oblivious to the pain that Debbie was still experiencing. Neither Debbie nor Mary experienced God’s loving presence in their interaction with one another. Neither of them was able to listen lovingly to the other. Imagine this: Debbie arrives home at the end of a troubling week, filled with problems with clients, and, receiving a speeding ticket for racing to her office to meet her deadlines. She was discouraged and exhausted, doubtful about God’s call to use her gifts business. In fact, she was having difficulty hearing God’s voice and believing that God was even interested in the awfulness of her week. After supper, she made a cup of tea and dialed Rachel’s phone number. Debbie thoroughly trusts Rachel to lovingly listen to her, to be present to her, pray for her, and offer words of love and wisdom. Debbie believed that Rachel represented God’s concern for her and called Rachel where they jointly entered into God’s loving presence via the telephone. At different points of my life I have been each of these characters: Debbie, feeling raw and discouraged, in desperate need for someone to lovingly listen to me, holding my heart before God in prayer while listening; Rachel, the loving friend, willing and able to listen wholeheartedly to the other; Mary, so self‑absorbed that I can’t even begin to listen to the words someone else is speaking let alone to hear the pain underneath the words. Of course, I like to think of myself as Rachel, the one able to listen with love and wisdom, but, naturally, I vacillate between all three characters at any given time yet I can choose between listening like Rachel or listening like Mary. Loving listening requires both time and the contemplative act of listening. We allow the other the passing of minutes to tell their story, allowing for the silence to provide those spaces where additional thoughts might surface from below. Loving listening takes time over a period of weeks, months, and sometimes years. I recently was reminded that loving listening over a period of years can occur in all of our relationship when my husband listened to me lament and struggle with an issue that I’ve been lamenting and struggling with since we met several years ago. Loving listening requires a contemplative heart, waiting for the other person to share their heart. Several years ago I read a profile of the journalist Barbara Walters about her interviewing trade secrets. She said she often remains silent after the individual makes a statement because usually in that silence the individual will disclose more to her. Loving listening offers silence as a way for people to ponder and reflect without disruption from me. Imagine this: Debbie arrives at church tired after a challenging week but calm and collected. She was able to talk with Rachel on Saturday and felt listened to and loved. After church she approached Mary and asked, how was your week? Mary, who needs someone to listen to her, began to tell Debbie her story of her week. And because Debbie received loving listening she was able to lean toward her and began to lovingly listen to Mary. “My friends, the world situation is grave. Humanity with fearful faltering steps, walks a knife-edge between complete chaos and a golden age, while strong forces push toward chaos. Unless we, the people of the world, awake from our lethargy and push firmly and quickly away from, all that we cherish will be destroyed in the holocaust which will descend. This is the way of peace: Overcome evil with good, falsehood with truth, and hatred with love. O God, you love us like a good parent, and are present in every aspect of our existence. May your nature become known and respected by all. May your joy, peace, wholeness and justice be the reality for everyone as we live by the Jesus Way. Give us all that we really need to live every day for you. And forgive us our failures as we forgive others for their failures. Keep us from doing those things which are not of you, and cause us always to be centered on your love. For you are the true reality in this our now, and in all our future. In the Jesus Way we pray. Amen. Loving God, in this third week of Advent, we praise and bless your name. Together with the prophet Zephaniah, we sing aloud, we shout your praise, we rejoice and exult with all of our hearts to praise your name. Loving God, we thank you that you are our strength and our might, that you are the source of our salvation, as the prophet Isaiah wrote. We thank you for your loving kindness and for your mercifulness. We confess to you Gracious One, that for many of us this Advent season has been difficult, filled with anxiety and worry as well as grief and sorrow. We long for the appearance of the Christ Child. We long for your loving presence. We confess to you now our longings. We thank you Merciful One, for your listening, loving presence. We thank you for your continual forgiveness. During the Advent and Christmas season we read the biblical story of Elizabeth and Mary, of Mary and Joseph, of the shepherds and the wise men. We also read of the turmoil surrounding these people‑‑ foreign government occupation, mass relocation on account of the census, genocide of infant boys. We are reminded that turmoil continues today throughout the Middle East. We are tempted to stop praying for peace because of the centuries‑old conflict, because of our weariness of praying for the area, because of our own lack of hope. God of Peace and God of Justice‑‑again we pray for peace in the Middle East. We pray for an end to the fighting, the deaths, the homelessness of a people. Again God, we ask you to move on behalf of our requests‑‑we pray for your justice and we pray for your peace. We pray for our country and for the conflicts we have here, particularly the racial divides that plague our nation. God of Peace and God of Justice‑‑we ask you to heal the racism in this country. We ask you to heal the racism in our communities. We ask you to heal the racism in our Church. Compassionate God, we thank you for listening to our requests and moving in this world on behalf of our prayers. We thank you that you are in our midst, that you rejoice over us with gladness, that you will renew us in your love, and you will exult over us with loud singing. We praise and bless your holy name. Amen. “It is time for religions to open the eyes of a world that believes it has seen everything.”—Daniel Kantor, Graphic Design and Religion. 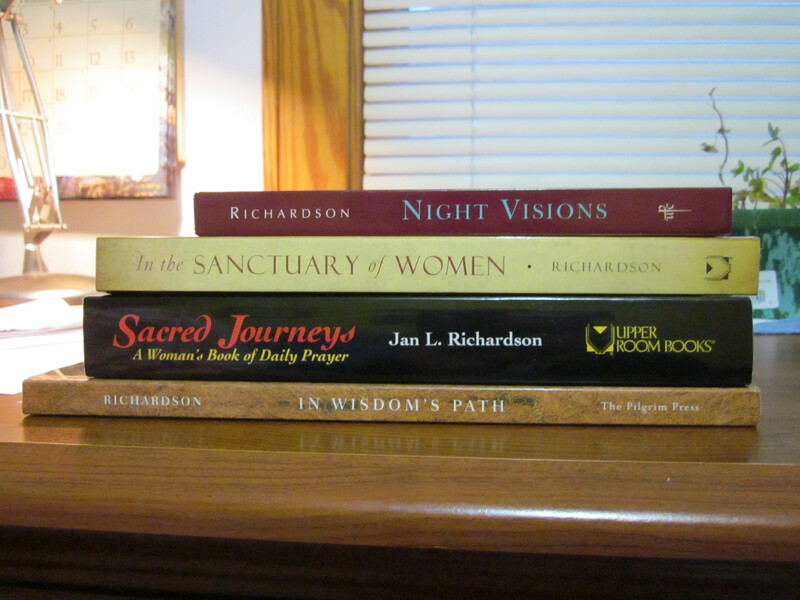 I recently heard artist and writer Jan Richardson at a conference. I’ve appreciated and admired Jan’s work for many years and I leapt at the chance to hear and see her and I wasn’t disappointed. Jan’s paper collages have inspired me as I think about fabric art. One workshop was led by Jan and her husband Garrison Doles on “Art into Faith” and I was nudged again to think how artists and “the arts” can become integral to faith communities. Here are my notes from the workshop and I want to emphasize these are my notes and I may have misheard or misunderstood Jan and/or Gary. Jan pointed back to medieval cathedrals that used a “multimedia” of art forms to embed the biblical Story into and for the medieval congregants to ultimately embody the Story in their lives. We need to reclaim the language of “symbol” and how symbols become a part of our existential being—and this is how the Story gets into our bones and we embody the Story of God’s love. Jan said there is a difference between reciting the Story and telling the Story, that is, we live into the Story and develop the skills to tell the Story through all forms of the arts and culture. It is a significant way to tell our story to God and to tell our story to each other. Yet, how can we, with our brokenness and our beauty, tell the Story (and tell our stories?). 1) Engaging people in the creative process, including people who don’t think they are creative. We are co-creators and collaborators with the Creator so we do have creativity. But we have become a culture of spectators so we let the professionals present to us. 2) We need to develop the talent and skills in people—like developing the “farm league” of a particular medium. 3) Decide to seek out those who have developed the facility to tell the Story that creates new doorways into the Story. 4) Art doesn’t happen in isolation but needs community, a fertile soil that provides cross-fertilization, and is focused on the process of telling the Story rather than a final product. 5) Discern who are the “culture makers” in the congregation and can lead into the mystery of the Story rather than a literal interpretation that limits another understanding of God’s love and interaction with humanity. 6) Challenge this statement: “I don’t know much about art but I know what I like.” Ask: why don’t you know much about art? Are you afraid of it? Are you choosing to be illiterate? Explore: How does art communicate with people? 7) Art jars us out of a particular way of seeing, understanding, and knowing. Art is always a dialogue—what happens in the heart of the artist and the heart of the other. Sometimes art can help us talk about the Story in ways that we haven’t been able to before. Find the line between the telling of the Story in a powerful and meaningful way and a place of emotional manipulation. What are your experiences of integrating art into faith? The origins of this day are found in the East, where a memorial for all of the Christian martyrs was celebrated, beginning in the fourth century. Currently the day is celebrated in different ways in various church traditions. When I was on the pastoral team at College Mennonite Church (Goshen, Ind. ), we celebrated All Saints the Sunday after November 1. Because CMC has a large group of retired persons and beyond, individual deaths are a regular part of congregational life. Remembering all the people who died throughout the year became an important and solemn ritual with each named called out, followed by a brief period of silence, and lighting a candle in their honor. When I was there, a large box of wooden matches was used to light the candle and in the midst of silence we heard the scratch of the match on sandpaper before it touched the candle wick. The rough strike of the match symbolically reminded me of the pain of our grief as we pondered the person’s death. Today I want to remember and celebrate five friends who have died this past year: Gene Herr, Lori Waas, Marie Reamer, Betty Snyder, and Dave Haarer. Gene Herr, Jan. 1: Gene, with his wife Mary, were the founders of The Hermitage, (Three Rivers, Mi. 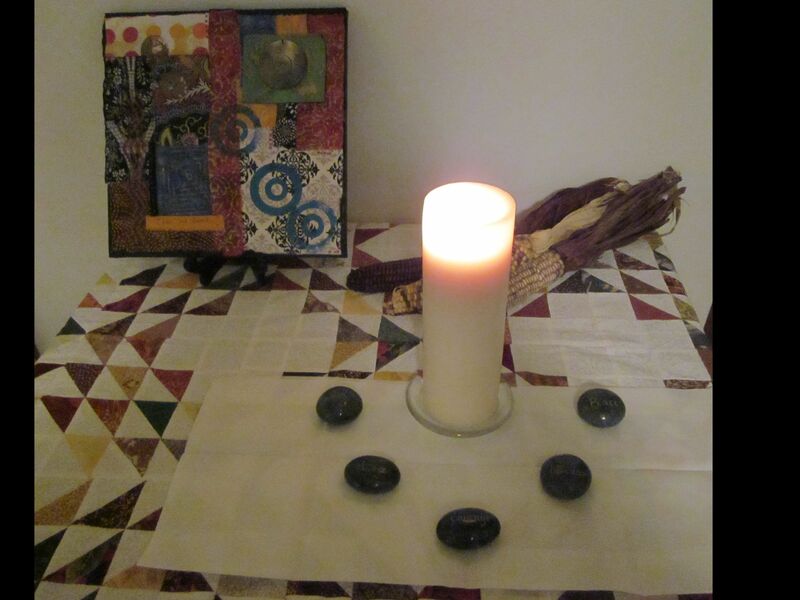 ), a contemplative prayer retreat center. Kevin and I volunteered there in the fall of 1999 during a time of transition for us and worked alongside Gene and Mary and continued our friendship after we moved to Lansing. Gene died of cancer in Kansas. On his Caring Bridge blog, his daughter described his final days as surrounded by hymns, prayer, and love. 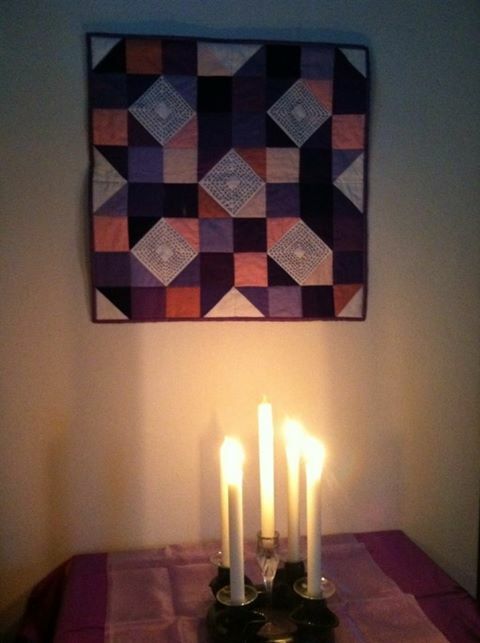 Lori Waas, April 6: I met Lori at church and although I didn’t know her very well, we had many things in common—quilting, music, politics, and theological questions. Now, whenever I listen to the Pink Martinis I think of Lori who was friends with several of the musicians. Lori also died of cancer. More than fourteen months ago her breast cancer returned and this time it moved elsewhere in her body. When she could no longer eat food she wrote on her Caring Bridge blog how sad she was to no longer enjoy the sense of taste with a delicious meal. Marie Reamer, April 23: I also met Marie at church where she sat in the same location of the pews. In her early 90s she always wore beautiful costume jewelry and colorful clothes, which I always admired (and, maybe, a few times, coveted). When we talked after church, she would take my elbow to hold onto for balance but I always received it as a gesture of affection as I leaned toward her to listen to her. Betty Snyder, July 23: Betty was one of my “faith idols”—someone whose faith I admired and appreciated. Betty was a kind, gentle woman who like a good giggle. She was a giggler. I often thought how I’d like to be like Betty when I grow up. My favorite memory of Betty is from a sharing time at MSU Mennonite Fellowship. One Sunday she told us about her prayer time earlier in the week: “And I just told God, “I love you! I love you so much.” She cried a little as she shared this and it was a sacred gift to peek inside Betty’s relationship with God. I continue to be grateful for her vulnerability in sharing this. Dave Haarer, Sept. 25: Dave was an enthusiastic, sincere man who believed the best of others. Once I called him, asked how he was and he responded: “I love my life and I love my wife!” Later that day I recorded this in my gratitude journal as I appreciated his zest for living. “One of the last things mom said before dying was, “I’m ready to go home.” Dad sees her a lot in his dreams. He talks to her in his sleep, and I guiltily yet greedily eavesdrop. Each time is similar: they are in a car on a journey through the countryside near where they first met. Once dad reached out with both arms, “I’m ready, I’m ready. Let’s do!” He wakes up, looks around, is bewildered. He turns to me and the look of disappointment is heartbreaking: “I’m still here.” He tells me mom said it wasn’t time, he must wait a bit longer. He has more to endure, more to accept, more to let go.” (Desert Call, Fall 2012, p. 29). Today I light a candle on our home altarscape in memory of these five friends. 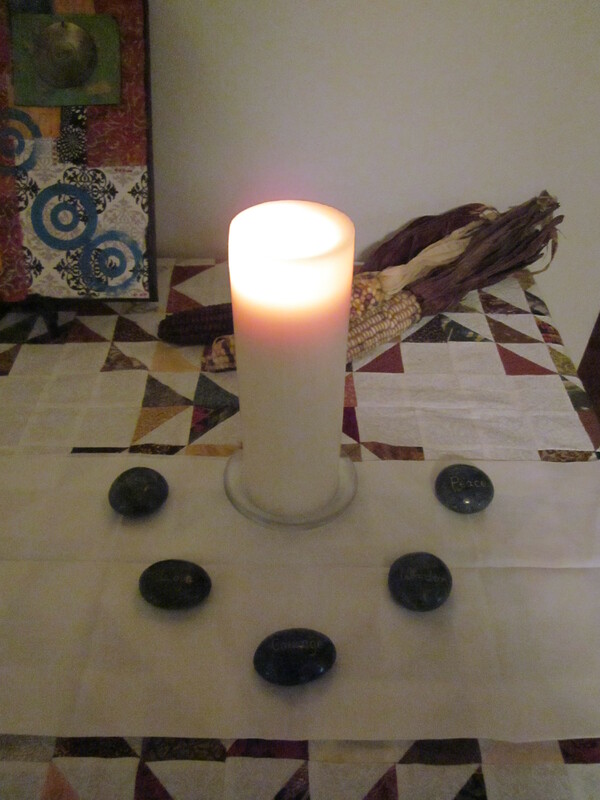 The stones surrounding the candle are each engraved with a word: “Courage. Love. Hope. Peace. Wisdom.” Words I associate with them in their lives and in their deaths.